Fort Mott (1872-1943) Fort Mott was established as the Battery at Finns Point during an upgrade of coastal defenses in 1872. 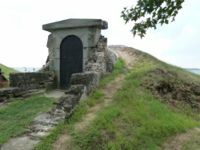 The upgrade was defunded by Congress in 1876 and the batteries remained partially complete. In 1896 work resumed and five Endicott Period gun batteries were built. 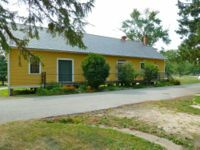 The post was named Fort Mott on 16 Dec 1897 after Major General Gershom Mott, who served in the Mexican-American War and the U.S. Civil War. Fort Mott was closed in 1943. Part of the Harbor Defense of the Delaware. The original plan for the fort included eleven gun emplacements with twenty guns and a mortar battery with six emplacements for Rodman Smoothbore guns. Construction was started in 1872, only two of the gun emplacements and two magazines in the mortar battery were completed before all work stopped in 1876. Five Endicott Period batteries were built between 1897 and 1902, Battery Edwards casemates were constructed from two of the original 1872 magazines. Moisture in the gun battery magazines was a constant problem and a separate Peace Magazine was completed to house munitions for the batteries in 1904. The Peace Magazine was connected to the main gun line by a railroad track through a tunnel cut in the parados. 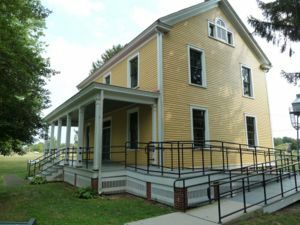 Fort Mott had over 30 buildings, including two large 115 men barracks, commissioned and non-commissioned officers housing, hospital, a post exchange, a library, a guard house, a stable, YMCA and a school for the soldier's children. Most of the buildings were constructed between 1897 and 1905. The two 5" guns from Battery Gregg were removed 30 Aug 1913 and sent to Honolulu. The two 5" guns in Battery Krayenbuhl were removed in Nov 1917 and eventually found their way to France in 1918. Both of the guns from Battery Krayenbuhl were returned to the United States in 1919 but they were not sent back to Battery Krayenbuhl and replacements were not furnished. The two 3" guns from Battery Edwards were removed in 1920. The fort went on caretaker status in 1922 and remained in that status until it closed in 1943. 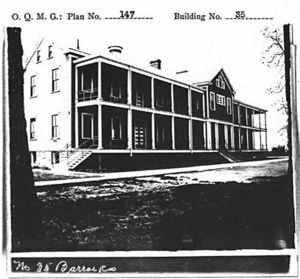 The officers quarters were removed in May 1933 and floated over to Fort DuPont (1). Both of the barracks buildings and the hospital were dismantled after the fort closed in 1943. Just before World War II started, only the six large caliber guns of Battery Harker and Battery Arnold remained emplaced. Three of Battery Harker's 10" guns and disappearing carriages were sold to Canada in 1941. Two gun tubes are on display at Fort Cape Spear in Newfoundland. Fort Cape Spear guns. The other was sent to Fort Prével in Québec. 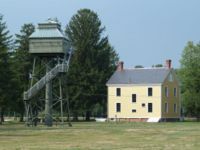 Fort Mott's officers quarters were moved across the river to Fort DuPont (1) in Delaware and the site was declared surplus in 1943 and the remaining armament was removed. 1907-05-20 Maj. Marsh, Frederick 2654 Cullum's Register doesn't indicate when he took command of the post. 1907-07 1909-10 Maj. Bennett, Charles A. 2890 Vol. 5 of Cullum 's Register gives start date as June 1907; Vol. 6 as July. In 1947 the State of New Jersey purchased the site and converted it to Fort Mott State Park. The park was opened to the public on 24 Jun 1951. No mounted period guns or carriages remain but the museum maintains an interesting gun yard. The batteries are well kept and interpreted well. Two fire control towers still stand on post. 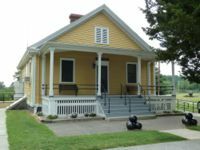 A 1903 Guardhouse building, a 1902 Headquarters/Administration building , a 1901 Ordnance building and the 1904 Peace Magazine have been restored. The ordnance building contains park offices and the museum. Location: Location Fort Mott State Park is on the Delaware River at Finns Point in Salem County, New Jersey. Click on the picture to see a larger version. Contribute additional pictures - the more the better! This page was last modified 20:35, 7 January 2019 by John Stanton. Based on work by Bill Thayer.